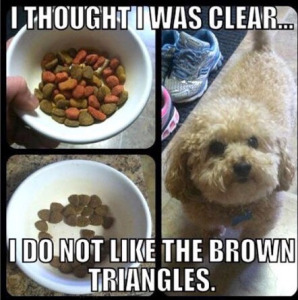 Your Canine Baby A Picky Eater? Stop the Cycle and Get Him To Love Healthy Dog Food | Scoop The Poop! How many of us are guilty of feeding our canine babies human food? Any of us that says no, stop fibbing :)). We are all guilty of doing it from time to time . Therefore let’s take responsibility of turning our fur baby into a picky eater who has forgotten they are still a dog. I’m a Professional Pet Sitter and have rules for all my fur babies . I love my fur babies and I love spoiling them. So yes I’m guilty of feeding them people food. I also recognize that can be harmful. And if I want my babies to be healthy a long time , I need to make sure they are eating healthy dog food. I want to help other pet owners continue to keep their pets healthy and turn that that picky dog eater into a lover of dog food.